Purchase plastic Christmas ornaments in whichever shape you prefer. Plastic is always safer than glass when you have pets around the Christmas tree! And, purchase or make tiny sized dog treats to fit inside the top opening of the ornaments. Wash the ornaments inside and out with warm soapy water and leave them open (the top pops out) to dry completely before filling them. 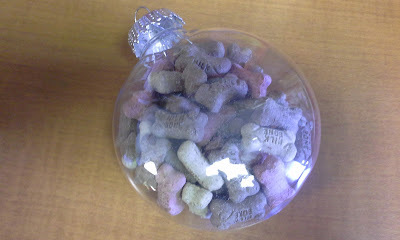 Fill the ornaments with tiny dog treats! Hint - if you leave a little empty space at the top of the ornament, it will be easier to pour out the treats to feed to your dog! If you fill it completely to the top, it may be harder to get the treats back out! After filling the ornaments, replace the top part back onto the ornament and tie a colored ribbon on to hang it with. 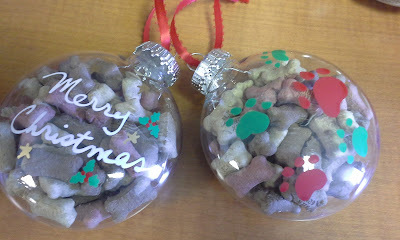 I used paint pens to draw and write on the outside of the ornaments to make them more festive! The paint will need time to dry - mine took several hours of sitting out to be completely dry. These are quick and easy to make and are absolutely adorable! 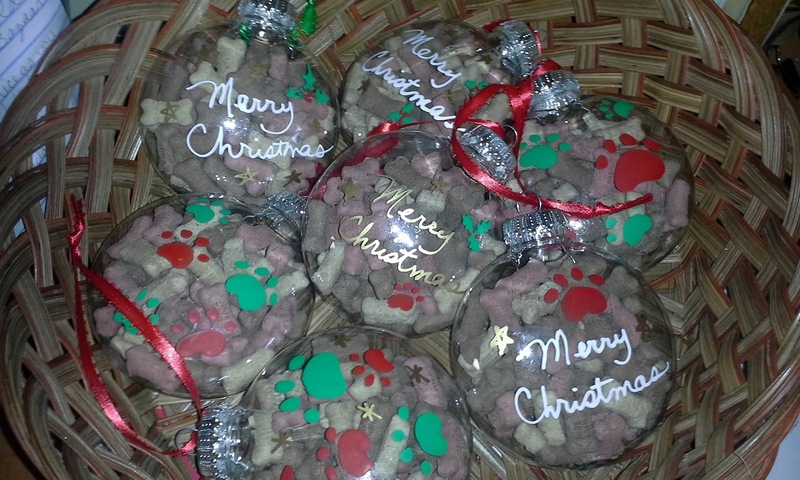 Easy to make for all the doggie friends! Very cute idea! I could never hang it on the tree though, we wouldn't have a tree for very long if I did!